F-MARC developed in 2003 “The 11”, a prevention program for amateur players whose effectiveness has been impressively proven in Switzerland. The nationwide implementation (2004-2008) led to a significant decrease in injuries during matches and training, proving not only the effectiveness of the program but that it is easily and broadly applicable (paper available in DOWNLOAD). Since then, “The 11” has been further developed (2006) into a more comprehensive program: “11+”. 11+ is a complete warm-up program to reduce injuries among male and female football players aged 14 years and older. The program was developed by an international group of experts and its effectiveness has been proven in a scientific study (Norway, 2008). Teams that performed 11+ at least twice a week had 30 – 50% less injured players (paper available in DOWNLOAD).The program should be performed, as a standard warm-up, at the start of each training session at least twice a week and takes around 20 minutes to complete. Prior to matches only the running exercises (parts 1 and 3) should or may be performed. For all exercises, correct performance is of great importance: please refer to the 11+ MANUAL for all details or the 11+ program! The “11+” has three parts with a total of 15 exercises, which should be performed in the specified sequence at the start of each training session. A key point in the program is to use the proper technique during all of the exercises. Pay full attention to correct posture and good body control, including straight leg alignment, knee-over-toe position and soft landings. Part 3: running exercises at moderate/high speed combined with planting/cutting movements. Players should begin with level 1. Only when an exercise can be performed without difficulty for the specified duration and number of repetitions should the player progress to the next level of this exercise. a) Ideally, progression to the next level is determined individually for each player. b) Alternatively, all players can progress to the next level for some exercises but continue with the current level for other exercises. c) For simplicity, all players can progress to the next level of all exercises after three or four weeks. Important: For all exercises, correct performance is of great importance. Therefore, the coach should supervise the program and correct the players if necessary. The course is made up of six pairs of parallel cones, approximately 5-6m apart. 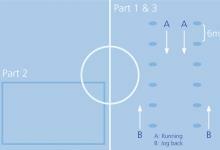 Two players start at the same time from the first pair of cones, jog along the inside of the cones and do the various exercises on the way. After the last cone, they run back along the outside. On the way back, speed can be increased progressively as players warm up.